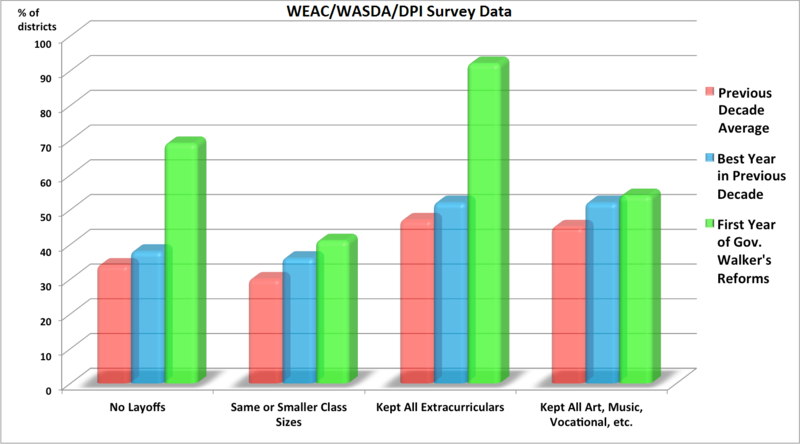 In all four categories – teacher layoffs, class size, retention of extracurricular activities, and retention of fine arts and vocational programs – the teachers union’s own data shows that a higher percentage of school districts are doing well (in two cases, a drastically higher percentage) under Walker’s much-demonized collective bargaining reforms than not only the average for the previous decade, but for that category’s best year in the previous decade. Add that to what we’ve known for over a year about the benefits teachers will still enjoy under Act 10, not to mention the recent revelation that Wisconsin taxpayers still pay them more than do taxpayers of the surrounding states, and the whole point of the recall collapses. But a narrow majority of voters still say they’d vote Walker out of office. How can that be? Simple: because the Republicans are doing a lousy job of informing the people. The Left is relentlessly pushing Big Union’s lies through the schools, through the press, and through thuggery, and what advertising the Walker Campaign and the GOP have done in response barely even begins to compensate for the dishonesty. Why isn’t the above chart in full-page newspaper ads across the state? Why aren’t the success stories from around the state on television every night? Why aren’t graphic comparisons of public and private-sector benefits on billboards throughout Wisconsin? I fear our party leaders are putting far too much faith in talk radio and social media to do the educational heavy lifting for them, content that they can get away with simply fundraising, rallying the faithful, and preaching to the choir. That’s a recipe for disaster. The people we need to reach, the people who will make the difference come Election Day, aren’t listening to Charlie Sykes or Mark Belling. They don’t have Twitter feeds for conservative reports to show up in. They aren’t glued to the blogosphere. The only way Republicans can get the truth to them is by taking it to where they’re going to be: the commercial breaks of American Idol, the pages of their local paper, the airwaves of their favorite music stations, the billboards along the highways they take to work. Comforting though it might be for conservatives to think otherwise, talk radio is not equal time. The blogosphere hasn’t created a fundamentally more informed populace. And Scott Walker’s personal goodness will not be enough to save his job in independent voters’ eyes. If we lose this thing, Wisconsin’s Republican elite will have nobody to blame but themselves. ← New at Live Action – Is the WI Pro-Life Community to Blame for Planned Parenthood Arsonist?